Nothing can top a game at Wrigley field on a hot sunny day. 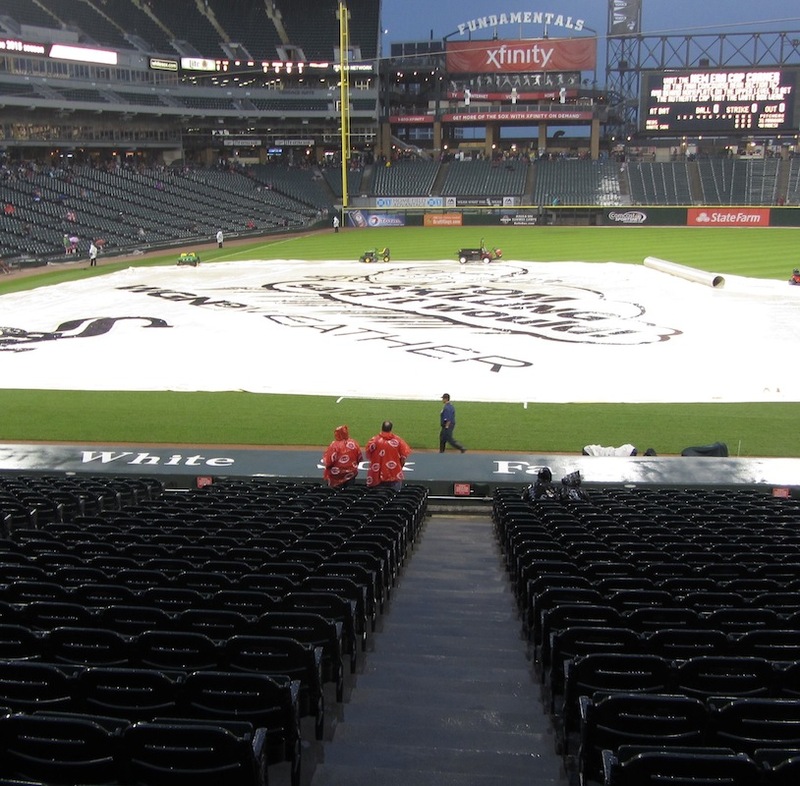 However, if you are visiting Chicago, a trip to U.S. Cellular to see the White Sox is well worth the time. I moved from Cincinnati to the South Side of Chicago in 1980. Living and dying with the Big Red Machine made me a National League guy so I adopted the Cubs as my team when I moved (except of course when they played the Reds). Even though the White Sox had the good sense to blow up disco records in 1979, won a division title in 1983, and had a certified young genius named LaRussa managing them, the White Sox and old Comiskey Park were off my radar screen.It never occurred to me that someone might actually want to see a baseball game in Chicago anywhere other than Wrigley Field. Things change. Thanks to my good friend Dwayne I saw the light and became a true South Sider. The old Comiskey Park was replaced by U.S. Cellular Field in 1991. It is a nondescript park just west of the Dan Ryan Expressway on the South Side of Chicago. Attending a game at U.S. Cellular is a very different experience than attending a game at Wrigley field. To best get a feel for U.S. Cellular I will wade into the dangerous waters of stereotypes, which in this case are reasonably accurate. For those of you familiar with the East Side versus West Side thing in Cincinnati, there is a similar stereotype in Chicago. The Chicago South Side is to the Cincinnati West Side what the Chicago North Side is to the Cincinnati East Side. 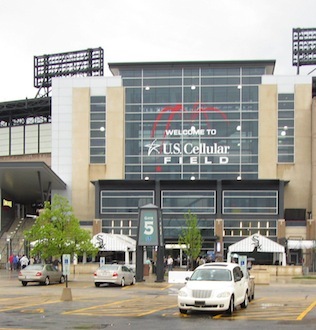 U.S. Cellular is in the Bridgeport neighborhood, historically a working-class area and home to the famous Daley political family. Wrigleyville is more cosmopolitan and eclectic. White Sox fans seem to truly hate the Cubs. I have long been convinced that a White Sox fan gets as much satisfaction from a Cub defeat as a White Sox victory. Cub fans seem to view the White Sox with utter indifference. If you plan a trip stop by Morrie O’Malley’s on 35th Street just four blocks West of U.S. Cellular. A great little hole in the wall with excellent comfort food. Cheaper and far better than inside the stadium. O’Malley’s has an excellent chili cheese dog, but not as good as a cheese coney at Chili Time in my old neighborhood of St. Bernard. A word of caution. Chicago is often much colder than Cincinnati in April and May. Be prepared to dress like February in Cincinnati. 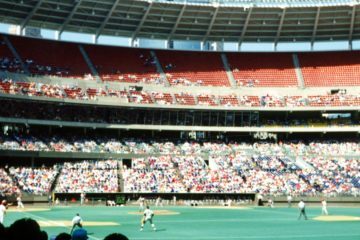 A few comments about the first game of the May 9 double header that I attended. 1) This is the first game where I recall seeing three runners being out at home. However, I do not think any of the plays were the result of bad base running. Frazier hustling around third and trying to score was smart, Cozart tagging was also a reasonable try, and finally Schumaker being tagged out took a lucky bounce and the catcher made a good play. 2) I was perplexed a bit by Price’s bullpen management. Going into the ninth inning the score was 3-1 and so the closer rules applied. Chapman warmed up. Then he sat down. As the top of the ninth began to drag on, Chapman got up a second time. After he got up a second time I assumed he would come in regardless of score. Then the score became 10-1 and Cueto started the ninth. I guess Price was thinking he did not want to use the bullpen up since it was a double header and Cueto was already warmed up. Then Price had to use Hoover when Cueto had trouble. Net effect, Chapman warms up twice and is not used and Cueto ends up throwing 123 pitches. 3) The White Sox fans get on Robin Ventura every bit as much as the Reds get on Bryan Price. 4) My White Sox friends laughed when they saw we had a DH hitting .180. The laughter subsided after three hits. Finally I cannot resist a Chapman rant. In 2014, his best season, Chapman threw 68.8% fastballs and 24.5% sliders. 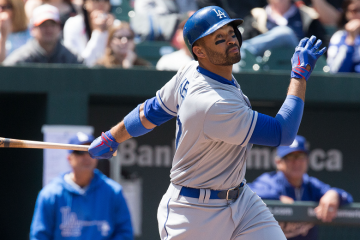 This year (through May 10) according to Fangraphs the numbers are 82.6% and 10.6% respectively. Why the change? If I am scouting the Reds I tell my players to not worry about anything other than a fastball. Just try and time the fastball. Gordon Beckham was listening. Addendum — he threw more sliders tonight (May 11) against the Braves and still lost. Ugh. Kipp flashing his St. Bernard hoodie and Redleg Nation hat. 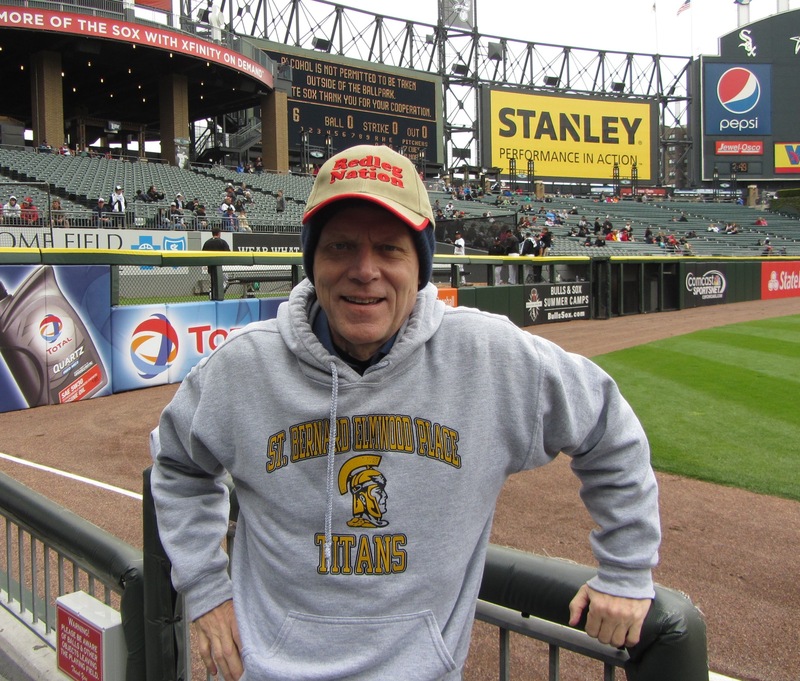 I went to see a White Sox game back in 2004 in Chicago. They were playing the Jays. I knew some of the players from each side and I enjoy a good ballgame no matter who is playing. The thing that struck me was just how STERILE the whole experience seemed. It could be that I’m just not a fan of AL baseball, but I have been to games at Wrigley, Miller, PNC, The Jake, Joe Robbie, and Yankee stadium, and none of them produced that muted feel to the game like what I felt at The Cell. Can’t quite explain what it was, it just felt like watching actors in a play instead of athletes playing the greatest game on earth. I’ve been to a game at The Cell and after taking the train, which runs along the Dan Ryan Expressway, I just missed being hit by a car getting across the street over to the stadium. There was probably a much easier way to get there from the train which I didn’t know about. The Cell was built across the street from Comiskey Park in the same way GABP was built next to Riverfront. The thing I liked best was you can walk around the park in the outfield and there’s plenty of food vendors and I found it a good way to watch the game. Ha! I saw you outside the stadium when I was buying my ticket Saturday & meant to compliment you on your hat.